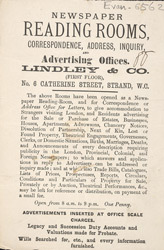 This is an advertisement for the Linley and Co. newspaper reading rooms on Catherine Street, in the Strand, London. Newspaper reading rooms like these were popular with the Victorian public. Admission to the rooms cost just 1 penny and the visitor had copies of all the leading newspapers and periodicals at their disposal. Interestingly this reading room could also be used as a temporary address for visitors to London. Those staying in the city for short periods on both business and pleasure would have found this a very useful service.